Hey everyone, you know the funny thing is that people say that the real work begins after the successful Kickstarter launch. 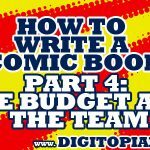 Make no mistake about it that running a Kickstarter is a tremendous amount of work – delivering the book is a different beast altogether. That’s a huge obligation, after all many people pledged to the Digitopia 1.0 Kickstarter, in fact over a hundred, perhaps you’re one of them (hi). Warning: I’ve tried to keep this update spoiler free but there may be some minor spoilers divulged in this update. The team and I have been working with a professional Comic Book Editor Hassan Ostmane Elhaou to rewrite the script. What was interesting about this was that we had re-written the original script about 4 times before going to layout. 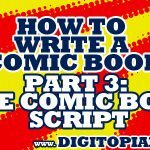 Now I had thought that after all that re-writing that the panels would just naturally transition to the comic book page – It doesn’t quite go like that. Once you’re in layout new questions come along. 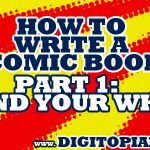 No matter how much effort was put into the re-writing process, actually drawing the panels show what’s working, what’s not working – and yes more re-writing is needed. Comics are obviously a visual medium, and any visual medium has an aesthetic versus a story telling conflict. This is nothing new, but you have to trust the artists involved that the storytelling drives the aesthetic and not the other way around. So I suggest if you’re looking for an artist, find one who is a good story teller – I’m lucky that Seb is a storyteller who understands how to use images for pacing, characterisation and narrative. Here’s a few pages to show how the layout evolves from the script. time spent in edit and layout is a real investment in the story. So what happens when the layout is different to the script? Will this has definitely happen here. Let’s take one of the examples where we’ve deviated (trust me this happened more than just once) – we have a scene where the Jay is attacked by a biker gang. So how on earth do we share this when the four of us are spread out over 4 locations, 11, 603km and there’s a 13 hour time difference between us? We’re talking about 2 scenes – when you’ve got a set page count you have consider any cuts made to one scene can allow space for any number of other scenes – which scene you cut from and which you give extra space to is a constant discussion. So we jumped on a Skype call – again when juggling full time jobs, family and other commitments finding time for all the team members to meet isn’t always feasible – you really have to trust each other and the tools to get the decisions made and communicated. Google Docs has this really great annotation feature to mark up images in – it’s right in the tool, I found this out on Skype by accident as Simon and I were speaking I drew a marquee over an area and it gave me the option to add an annotation – nice one GDrive team! I then was able to link to each of these comments directly in Slack – which made it a lot easier to communicate what could be quite a complicated process. all whilst trying to preserve some sanity? So I built up another Google Sheet here. As spreadsheets go, this is at least one of the more exciting ones I’ve put together. Does it link to another page?– this is important to know whether we’re going to re-visit this scene/page, whether this scene/page closes of an earlier one or whether this scene/page sets something up later in the script – again if the answer is ‘No’ then we have to consider whether it should be in the script. You can see that scene F was one that we cut from this issue – it’s going to move to issue 2, again that is something that we couldn’t have know unless we went through this process – in fact scene F was never written in the actual script, it was added in edit, shifted in layout. Does this mean the layout will translate to inks? Well the team and I are aiming to get the layouts finalled this week (week commencing 23rd July 18) – we’ll then move to inks, I’m hoping that it will be consistent and plain sailing from here on it, but similarly to how the pages change from script to layout, there may be some more modifications as we move into inks – not withstanding any brainwaves we may have to change the script between now and then. Thanks for reading this far, I’d love to hear your feedback on any similar projects/experiences you may have had and the methods you used to resolve the issues – the best place for that is the comments’ section below. 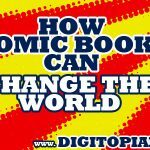 While you here do have a look around the blog and remember you can read the web comic here at www.comic.digitopiafilm.com if you want a free comic preview use this nifty little form right here and I’ll email one to you straight away. Oh yes, also do hit those social share buttons to tell your friends and anyone else who may find this content valuable.